The Mediterranean diet was declared Intangible Cultural Heritage in 2010 by the United Nations Educational, Scientific, and Cultural Organization (UNESCO). It has been awarded such recognition because it involves “a set of skills, knowledge, rituals, symbols and traditions concerning crops, harvesting, fishing, animal husbandry, conservation, processing, cooking, and particularly the sharing and consumption of food”. The Mediterranean diet includes the cuisine and culture of Cyprus, Croatia, Spain, Greece, Italy, Morocco, and Portugal. It has a great emphasis on food as celebration as it plays a huge role in social gatherings; strengthening communities and the collective identity. Women are in charge of passing down the traditions, from ancient recipes for baking bread to the craftsmanship of ceramic plates and other food receptacles. The elderly are highly respected. And farmers and other local producers are distinguished at the lively markets, where their knowledge is also transmitted to the general public. Key Mediterranean lifestyle factors are relationships, pleasure and leisure, which help to reduce stress and contribute to mental well-being. Moderate-intensity activity is part of the everyday life. Think of long walks or even a couple of hours of gardening. At least two and a half hours of moderate exercise a week with a couple of muscle-strengthening activities is strongly recommended. 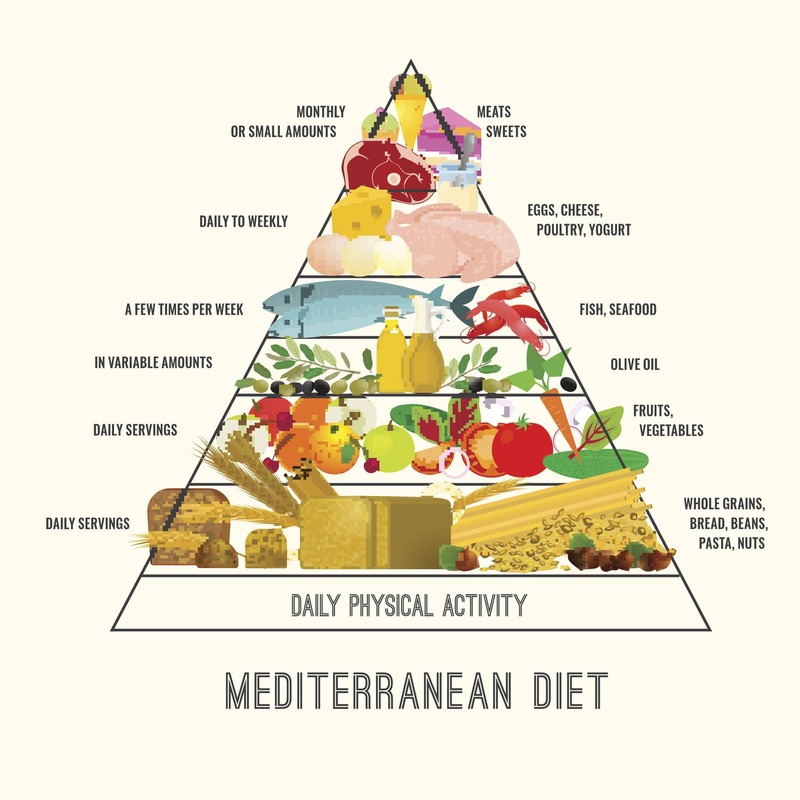 The Harvard School of Public Health, the non-profit Oldways, and the World Health Organization (WHO) introduced the classic Mediterranean Diet along with the Mediterranean Diet Pyramid in 1993. Since then, the culinary guide and ancient wisdom of this region have been regarded as one of the healthiest nutrition patterns in the world. It is balanced and therefore safe to follow for people of all ages. Even vegetarians and gluten intolerant patients can stick to the diet with a few substitutions. Consume plenty of seasonal vegetables. Reduce your overall intake of red meat. Eat like a vegetarian one day of the week. Use extra virgin olive oil in daily meals. Switch to whole grains and whole grain bread and pasta. Choose quality organic or artisan dairy products.